Fine Art Services | Private Sales | Gallery | Musical Instruments | Diamonds | Lobbying Services |: "Who could better that propeller?" versus "Who could better that BMW ?" "Who could better that propeller?" versus "Who could better that BMW ?" 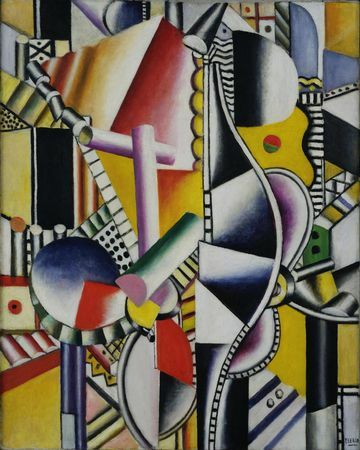 In 1912 while visiting Salone de la Locomotion Aerienne in the company of Fernand Léger and Marcel Duchamp, Constantine Brancusi noticed a propeller. According to Marcel Duchamp, Brancusi did exclaimed wonderstruck "Now that is what I call sculpture!" and concluded "From now on, sculpture must be nothing less than that." "Before the Great War, I went to see the Air Show with Marcel Duchamp and Brancusi. Marcel was a dry fellow who had something elusive about him. He was strolling amid the motors and propellers, not saying a word. Then, all of a sudden, he turned to Brancusi, `It's all over for painting. Who could better that propeller? Tell me, can you do that?'" 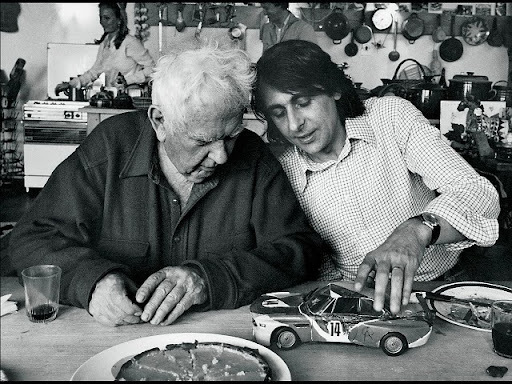 In 1975 French race car driver and auctioneer Hervé Poulain asked Alexander Calder to customize his BMW 3.0 CSL which later participated in the 24-hour race at Le Mans. Prompted by enormous enthusiasm from public for this work of art on wheels, BMW then decided to put its brilliant idea of establishing the Art Car Collection into practice. Today there are 16 cars painted by famous and not so famous artists on permanent display at the BMW museum in Munich, Germany. Paraphrasing Marcel Duchamp, I am asking: Who could better that BMW ? Duchamp, Leger and Brancusi have been inspired by the form of the propeller, and without doubt they created art forms more beautiful than the propeller. 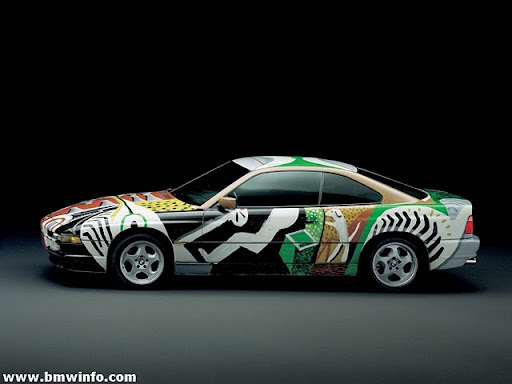 On one hand some considered that the artists who painted BMW's blended mpdern art with design and engineering. On the other hand it is considered that the artists destroyed the beauty of car lines and the art of a mass produced "object" is more beautiful than the art of David Hockney, Jenny Holzer, Roy Litchenstein, Frank Stella, Robert Rauschenberg and Andy Warhol who all "painted" a BMW. Calder's artwork was on show the very same year at the 24-hour race at Le Mans, an event which the artist attended. 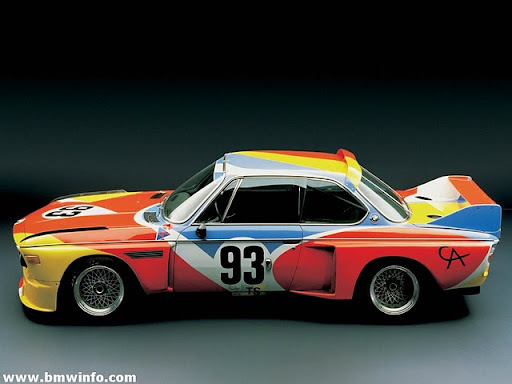 The BMW 3.0 CSL, with which Alexander Calder laid the foundations of the Art Car Collection in 1975, was also one of the last works he produced before his death. right: Andy Warhol painting the car. "I tried to portray speed pictorially. If a car is moving really quickly, all the lines and colors are blurred." "And then, I must admit, I also looked at the other Art Cars. In the end I thought, probably it would be good to perhaps show the car so you could be looking inside it." To turn his idea into reality, Hockney took several months and allowed the inside of the BMW 850 CSi to be outwardly visible. Stylized intake manifolds of the engine appear on the hood, and the silhouette of the driver can be seen on the door. And you don't just see the inside of the car, but also excerpts of an abstract landscape. Because "traveling around in a car means experiencing landscapes", says Hockney, "which is one of the reasons why I chose green as a color." 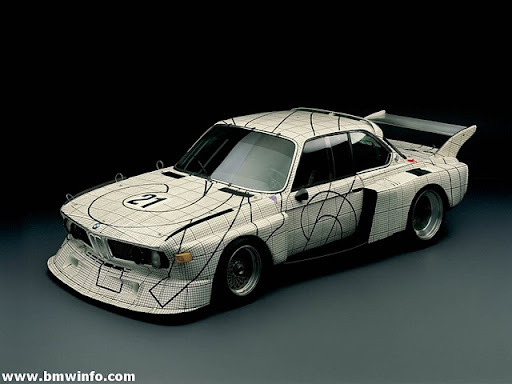 "The pattern should be regarded as agreeable decoration", says Frank Stella of the black and white square grid with which he covered the BMW 3.0 CSL. A pattern which has an evenness and precision reminiscent of oversized graph paper. Within the grid, numerous lines run across the whole bodywork and leave the car looking like one great pattern. While working on his draft version, Stella disassociated himself from his usual random style of painting and sought inspiration from the technical aura of the sports coupé. The BMW 3.0 CSL took part in the 24-hour race at Le Mans - for Stella, a passionate fan of motor racing, it was a very special premiere for his new work of art. 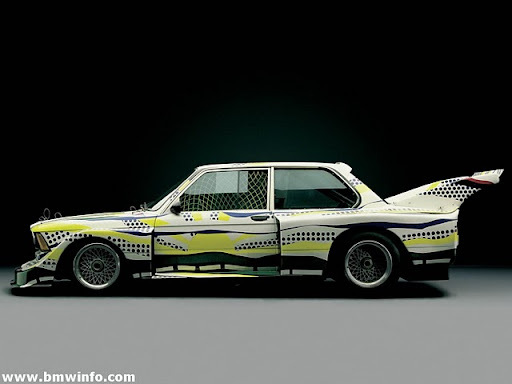 "I wanted to use painted lines as a road, pointing the way for the car", says Roy Lichtenstein of his portrayal of the BMW 320i. "The design also shows the scenery through which the car has driven. You could call it a list of all the things a car experiences - the only difference is that this car mirrors all these things even before it takes to the road." 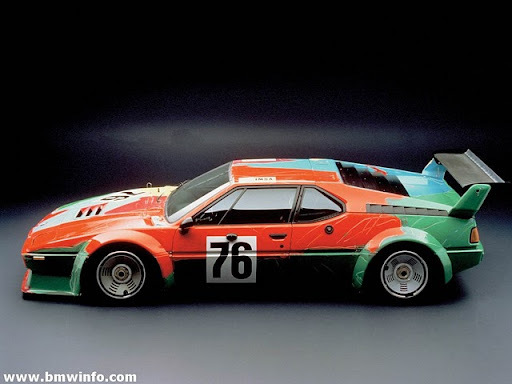 In the same year, his BMW Art Car won second place in its class at the 24-hour race at Le Mans.